Definition of Shamanism: What is Shamanism? Shamanism incorporates a range of beliefs and practices regarding communication with the spiritual world in which a religious leader, like a Shaman, enters supernatural realms or dimensions when the tribe is facing adversity or to obtain solutions to problems afflicting the community including sickness. The term 'Shamanism' is derived from the Sanscrit word "sraman" meaning a worker or toiler. Shamanism is not a specific religion but a doctrine based on a belief that physical nature might be brought under the control of man. Shamanism prevails among American Indian tribes and blends with their varied religious beliefs, rituals, ceremonies and customs. The doctrine associated with Shamanism is probably one of the oldest beliefs of man, with its origins probably dating back to the Stone Age. The ancient Mississippian culture of the Mound Builders of North America were part of the Southeastern Ceremonial Complex of American prehistory (S.E.C.C.) who embraced Shamanism. The Mississippian Native Americans were the last of the mound-building cultures of North America in the Midwestern, Eastern, and Southeastern United States. Some Native Indian tribes still retain some elements of the Mississippi culture, including Shamanism. A shaman was a spiritual leader and healer of the Mississippian Indians who believed that within the Shamanism creed that the shaman communicated with spirits in other worlds. Shamans used dances, gestures and sounds as the symbolic powers of Shamanism to enter the spirit world. 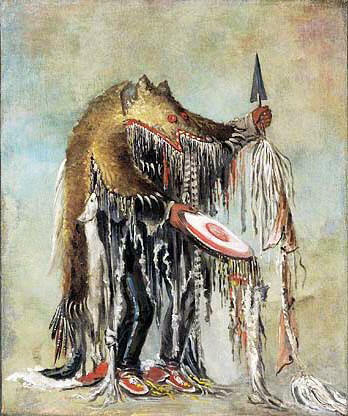 Shamans wore ceremonial clothes and carried sacred objects such as rattles and drums to incarnate the spirits of nature and amplify their power. The ancient Shamans of the Mississippian Indians also used masks that were believed to hold spiritual powers and would identify them with the spirits and activate their power. For additional Information on Shamanism refer to the article on the Shaman Symbol.